Michigan State's offensive line, led by NFL prospect Jack Conklin and relentless center Jack Allen, could drive the Spartans to the College Football Playoff. 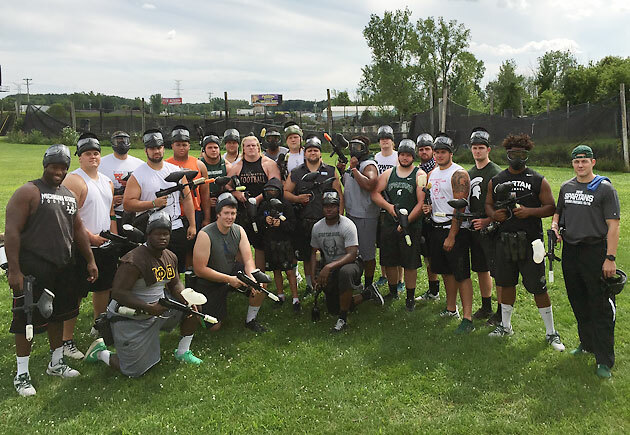 EAST LANSING, Mich. — There were rules for the Michigan State offensive line’s annual paintball outing in July. Everyone had to wear shorts. And no one was permitted to wear sleeves. These were in fact the only rules because this was a list conjured by Jack Allen, an angry cannonball of a center whose 3.3 grade point average and subversive sense of humor make him a really bad person to put in charge of paintball. So there is a picture of the group, expressionless on the grassy expanse of the paintball range, with goggles and facemasks and rifles and arms spilling out of cutoff shirts. This is the before. There are no pictures of the after. There were a lot of welts in the after. We are accustomed to this sort of thing from any offensive line. We are also accustomed to a certain level of brawling cruelty from Michigan State in particular, a program founded upon trench dominance that has won 11 or more games in four of the last five seasons. We are even accustomed to the Spartans running deeper with malice than most teams, as they deploy seven or eight linemen on any given weekend. More significant, and so much more portentous for this fall, is how this line is unlike any of the others before it. It may be the best and most athletic group of Mark Dantonio’s tenure and one poised to catch the eye of a league that bizarrely has ignored it every spring for the last nine years. Michigan State has not had an offensive lineman drafted into the NFL since 2006. A program buttressed by player development somehow has not developed the brand of grunts coveted most at the next level. 2015 Big Ten preview: Which team is capable of challenging Ohio State? That will change next spring: The Spartans’ line is a group that can rely on physical gifts as much as ornery dispositions this fall. That conveniently doubles as the ideal foundation for a team aching to reach the College Football Playoff and shake loose any lingering doubts about the existence of a national power in East Lansing. Michigan State’s preferred demeanor has remained constant. “We want to punish you,” Staten says. And the Spartans, generally, have always been big: The line and tight ends in 2007, Dantonio's first season, had an average height of 6'6", and seven players on the initial two-deep for '15 are 6'3" or taller. (Three offensive line recruits for '16 are also all 6'3" or taller.) But the nimbleness in those frames has evolved some. Size and sheer brutishness isn’t sufficient alone, even for a program that revels in it; rage is useless if a defender blows past before you can apply it. The program needs not look far for the archetype: the 6’6”, 325-pound Conklin, who no one expected to be the archetype of anything. His story is well-worn—a zero-star recruit from where else but Plainwell, Mich., no big-school scholarship offers, set to attend prep school until Dantonio presented a grayshirt plan—but it grows more irrelevant by the day. Conklin could be Michigan State’s first lineman selected in the first round since Tony Mandarich—yes, Tony Mandarich—in 1989. Conklin’s blend of athleticism with raw power should be impossible to ignore. It was his speed as a high school senior, in fact, that caught Dantonio’s eye on film. He has not lost a step, either. Just ask the loathe-to-admit-it teammate who Conklin races on a regular basis as part of a never-ending competition. But Conklin doesn’t set himself in a three-point stance to begin a track meet with defensive ends. His considerable reach (he has an 84-inch wingspan) and innate strength are more useful there, and they make more lasting impressions. “He’s got some shock to him,” Spartans quarterback Connor Cook says. Conklin led the Spartans with 113.5 knockdowns in 2014, including 10.5 in a game against Ohio State, when he mostly matched up with Big Ten sack leader Joey Bosa. Dog-eared as his walk-on history may be, it is at the root of everything for Conklin and won’t leave him. He ultimately may be the perfect individual to end that NFL draft snub streak because he may be the perfect Michigan State lineman: athletic, brawny and moved by the inescapable feeling that nothing is ever good enough. When it came time to catalog the nickname for Allen, the senior center and alpha personality of the group, Staten was stumped. Somehow, after four years, he didn’t know it. So he asked. “Just ‘Jack,’” came the replies. However Michigan State’s line evolves, the program will do well not to drift too far away from the Just Jacks and the unembellished world they inhabit. To be clear, in 2014, Allen earned All-Big Ten honors and a spot among six Rimington Trophy finalists. He led Michigan State with 18.5 “dominators.” (A “dominator” involves very specifically putting a defender on his back and landing directly on top of him.) He is a talented player who may prove to be the best center in college football this fall. If his 6’2” frame is not exactly the professional ideal, there are few other areas in which Allen comes up short. “He really has been, for a long period of time, a little bit of the glue,” Dantonio says. He really has been, for a long period of time, a little bit different. There are three Allen boys: Jack; Brian, the middle child, who is a sophomore guard with the Spartans; and Matt, a high school senior committed to follow both brothers starting in 2016. All will pass through Michigan State’s walls but only after destroying their own. Wrestling was the clan’s other dominant activity—both Jack and Brian won state championships—and the basement of their Hinsdale, Ill., home featured a mat positioned under a hanging light bulb. As a result, the drywall of the basement often featured large dents and gashes. At one point a friend of Matt’s crashed back-first through a wall, which incensed John Allen, the family patriarch. “Because it was like the third time that year,” Brian Allen says. Allen likes to pulverize competition. But he is predisposed to laughs borne of thinking a little oddly; once, when the stoic Dantonio walked out on to the field to deliver his standard post-score fist-bumps, Allen snaked a hand to Dantonio’s face, yelled “Snail!” and jogged away. But he is no goof-off. Conklin lauds his linemate’s organization, noting how often Allen studies practice video on his iPad. “People don’t understand how smart a guy Jack is,” Conklin says. In the film room with Cook, Allen goes beyond examining defensive fronts and will identify coverages as well. The Spartans’ quarterback was sacked just 11 times in 2014, a number he in part attributes to the line’s ability to process defensive changes efficiently. Cook says he has often found himself sensing that he should go to the hot read off a blitz, that he should get rid of the ball quicker than he’d prefer…and instead he’s comfortable, with as much time as he needs, because Allen redirected his linemates to new responsibilities that they tended to flawlessly. If Conklin represents the perfect Michigan State lineman, Allen represents the balance Michigan State must strike moving forward: As tantalizing as prospects with coveted measurables might be, the program must not wander too far away from the linemen who view things in black and white, who view every snap as an opportunity to kick someone’s teeth in, who surrender a couple inches but nothing else. Conklin is a list-maker, and among his current goals are a spot on All-America teams and the Outland Trophy. There is a reason that voicing these desires for individual accolades is copacetic: Dantonio insists his players “dream big,” as he puts it, that they believe they are capable of performing at the next level or being the best in the country at their position. Extrapolate that to the program itself, and it is fine that the Spartans have been good up front before—Dantonio points to 2007’s unit as a “great offensive line”—but there is plenty of room for growth. Now, a little less than a decade into its coach’s tenure at East Lansing, a little less than a decade into developing talent to meet championship expectations, Michigan State has a group that can sustain a playoff push while also catching the eye of NFL beholders. In the offensive line room, a bison skull hangs above Staten’s desk in the front corner. It was a gift from a Michigan State graduate from Conklin’s hometown who wanted it to look over the big men—“It needs a name, doesn’t it?” Staten said—and it is décor befitting the space’s main tenants. There’s also a bobblehead of Alan from The Hangover that used to talk before its batteries ran out, as well as a dry-erase board listing the five goals for the offensive line each game: winning, allowing no sacks, gaining more than 200 yards rushing, averaging four-plus yards on first downs and out-toughing the opponent. Big Ten team superlatives: Who's most improved, underrated, more? But there may be some redecoration to display each lineman’s running tally of knockdowns and dominators. Conklin and Allen bet a steak dinner on who would win more internal offensive lineman of the week awards in 2014. At the end of the year, Conklin claimed victory, 4–3, only to have Allen check the records and note that the final score did not include the Cotton Bowl. Allen sent Conklin a picture of the grades for that game. It forced a tie, four weekly honors apiece. Thus the competition has been carried into to 2015, with a requisite increase in the winner’s take. 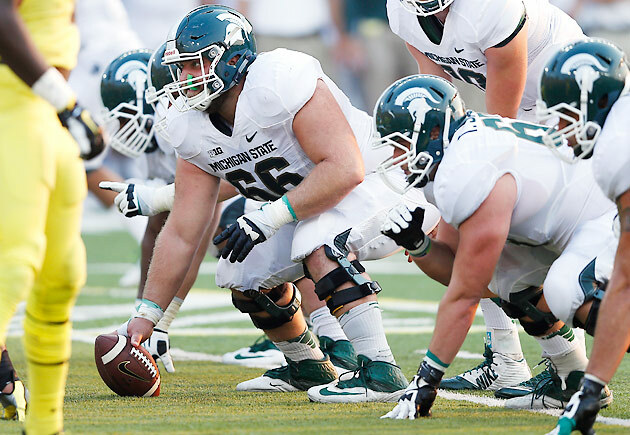 In the evolution of Michigan State’s offensive linemen, it seems likely professional salaries may subsidize the wager. But the bet is more important than the payoff because the bet is in service of a team aiming to do more than it has. Allen and Conklin, with the others, can push the Spartans into the playoff and into the national consciousness for good. These are people who play paintball in shorts and sleeveless shirts. They are predisposed to leave a mark.